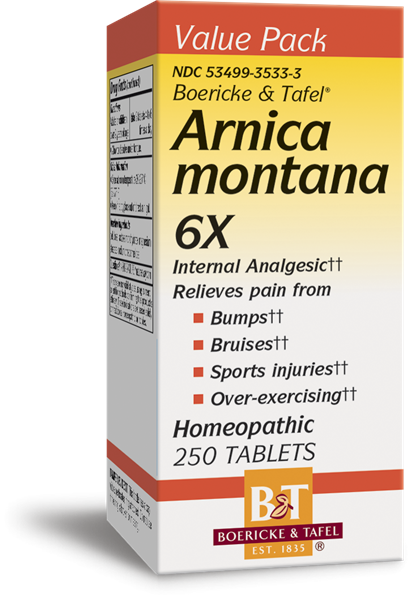 Arnica montana 6X Tablets / 250 - Nature's Way®. Adults or children over 2 years of age: take 3 tablets 4 to 6 times a day. Allow to dissolve under tongue. Do not use this product for pain for more than 10 days for adults and 5 days for children unless directed by a doctor. When using this product, if pain persists or gets worse, if new symptoms occur, or if redness or swelling is present, consult a doctor because these could be signs of a serious condition. If pregnant or breast-feeding, ask a healthcare professional before use. Keep out of reach of children. In case of overdose, seek medical help or contact a Poison Control Center immediately.